Today, Friday, April 21, 2017, until Monday, April 24, 2017, my second novel, Next Door Neighbors, will be FREE! (The eBook version only). 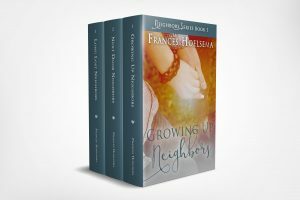 Yes, I know that I just had my debut novel, Growing Up Neighbors, for free not too long ago, but since that book is a different genre, I thought it would be a good idea to also try Next Door Neighbors for free. 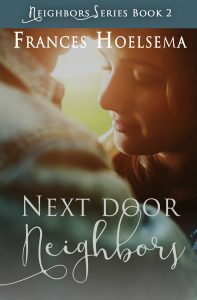 Next Door Neighbors is my first contemporary romance. Don’t let that scare you away, though! It’s completely clean so you don’t have to worry about reading things that will make you blush or feel ashamed about. You can also feel perfectly good about sharing, which I hope you will! One great thing about Next Door Neighbors is that it also has an underlying message of what true love is all about. It’s not something you just feel and say to one another. It’s actually something you DO! Throughout this novel, you’ll see some strong attraction, yes, but you’ll see some ways the main characters show true love. Sweet, right? I thought so! And this is all for FREE! I’d be so honored if you’d take a chance on me and read it! I’d be even more honored if you’d share this great news! Oh, and one more thing. 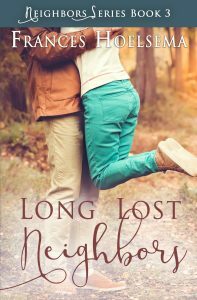 Though this is the second book in my Neighbors series, it is a completely standalone novel. You do not need to read the first book, Growing Up Neighbors, or last book, Long Lost Neighbors, (though, I hope you do!) in order to enjoy Next Door Neighbors! Elena Montgomery, an elderly victim of fibromyalgia, has two main loves in her life: Brian, her attractive and hard-working son; and Jill Stevens, her caring friend and next door neighbor. When Brian and Jill meet for the first time, they have a chemistry that no one can deny. Although Jill finds herself wanting to get closer to Brian, she believes she can’t. Being hurt in the past, she vows to remain single the rest of her life, thinking it’s better not to love than to love and get burned. Brian, on the other hand, wants to get to the bottom of her fears and show her that not all men are the same. He is determined to win her trust, her heart and her hand in marriage. Through pain, passion and pursuit, will Brian be able to prove to Jill what true love is all about?